Chicago is a dynamic and fascinating city with spectacular architecture and a dramatic setting on the shores of Lake Michigan. The largest metropolis between the coasts, it has the biggest population, the most problems...and the greatest potential. Edens Lost & Found tells Chicago's story by threading together the stories of a diverse group of its active and committed citizens including volunteers, professionals, students and community leaders -- among them, the city's mayor, Richard M. Daley. 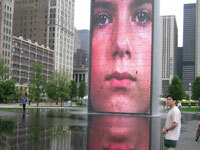 During his tenure, Chicago made a powerful commitment to open space with the creation of the 24-acre Millennium Park built atop a parking garage in the heart of downtown. The city has also become a laboratory for green architecture with the award-winning City Hall Roof Garden and Green Roof Initiative. Whole neighborhoods are getting involved in the effort to create more livable communities. Eden Place is a prime example of grassroots determination to reclaim for themselves pieces of Eden that had been lost to generations of apathy. And out in the suburbs? An Elgin High School environmental instructor convinced the school board to set aside adjacent land as an outdoor classroom and nature preserve. Here, her students are learning to become leaders in the movement to create sustainable ecosystems. Edens Lost & Found - Philadelphia - Faced with severe budget limitations, Philadelphia's rebirth is being brought about by a network of community-based volunteer organizations. "There's something positively redemptive about Edens Lost and Found, the new PBS series about the transformation of dismal urban spaces into gardens and parks, villages and murals that are green and welcoming." "Wiland and Bell show us that some of the real solutions might just be on our doorstep, our roofs, and in our city halls." "An inspiring look at how cities can be transformed and how parks and green space can heal the soul of a community." "Inspiring examples from Chicago, Los Angeles, Philadelphia, and Seattle show how people can rediscover the natural attributes that made their cities desirable to settle in the first place." "This film does an interesting job of presenting how a need for green spaces in urban areas became an important aspect of city planning. In the case of Chicago this has been something in which the city's residents have actively engaged and a matter that has become an area of pride to the citizens." "Eden's Lost and Found does an excellent job in documenting efforts to preserve greenspace and natural environment in both Chicago's frontyard and backyard...This is a solutions-oriented film about community-based organizations and community activists who do not shy away from challenging the status quo. It is a primer on what positive outcomes can result when communities work together to protect their quality of life." "As a professor of environmental planning and management, I always search for good movies to use in my classes...I was delighted to come across Eden's Lost and Found: Chicago. This documentary is a remarkable source of information about a diversified number of topics. It is a movie that is enjoyable to the average lay person and useful to students of environmental studies, landscape architecture, and urban planning. It focuses on Chicago as a case study, but the lessons drawn are applicable to metropolitan areas worldwide." "Fascinating...Edens Lost and Found: Chicago offers a positive look at how individuals as well as whole neighborhoods band together to improve their local communities. From the award-winning City Hall Roof Garden and Green Roof Initiative to an outdoor classroom and nature preserve adjacent to the suburban Elgin High School, Edens Lost and Found: Chicago is an amazing showcase of how modern-day Chicago is facing up to environmental challenges...Also highly recommended are the other DVDs in the Edens Lost and Found series covering Philadelphia, Los Angeles, and Seattle." "I used Edens Lost and Found to organize a course I taught this summer...What a great class we had! The series proved to be a valuable tool in focusing the student's attention. By highlighting a variety of topics, institutional arenas, and personalities involved with environmental sustainability in four cities, the series alerted my students to the opportunities and challenges available to policy makers. The fact that the series showed the struggle to incorporate environmental values in everyday life, in education, and in public policy agendas at the local level, and the fact that sometimes the best intentions did not work out, provided a realistic sense of the challenge...Several of the grad students had not been exposed to the environment in this way, and told me that the class was an eye opening experience. Two were inspired to do their graduate applied research project on environmental sustainability. The Edens Lost and Found series is an important addition to material available to introduce students at all levels to environmental values. The presentation of some hard lessons regarding success and failure, and how much time and effort go into trying to change our neighborhoods and cities makes this series unique. I look forward to the next opportunity that I have to use the Edens Lost and Found series, and recommend it to educators at all levels." includes 45-page teachers' guide, Chicago action guide, interview with Scott Simon, 18-minute trailer of the other three films. "These effective, professionally produced programs will inspire cities and towns all over the United States to use more green building materials, cultivate and employ native trees and plants for landscaping, find ways to practice conservation, and minimize disruptions to the natural environment. Recommended for all collections." "It is heartening to see how one woman's struggle to save the prairies, one teacher's quest to educate teenagers about the environment and sustainability and one family's efforts to transform a vacant lot could make a difference not only on the environment but also on the younger generation. Overall, this is a very inspirational movie. It is highly recommended for school and public libraries."